Here are a few pictures of the sun taken over a 3 or 4 minute period. Before this it was all grey; after this is was again all grey. With a standard 4x40 scope with standard sun shade you would be able to get sights of this sun at the times of the best views below, providing you were standing there waiting and ready to go. You might just have a few seconds, but as long as you can see the outline of the disk you can get a sun line. It might not be your best work, but it will be usable if that is all you have. This is a point that came up several times in the voyage documented in Hawaii by Sextant. At the end here we show that it can't be too far off, even in these cases. To get a feeling for how far off a sight like this could be, we take a look at the scale of things. When we take a sun sight, the bottom edge of the sun should just touch the horizon. Our job in all sights is to be sure this is aligned as precise as possible. But how far can we be wrong? 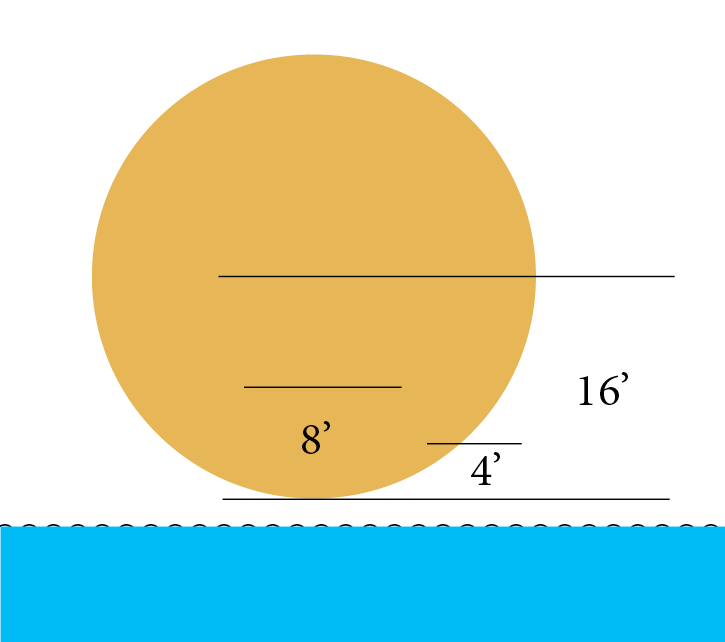 The semi-diamter of the sun is about 16'. The sun above is not aligned properly; that is very easy to see. This one is off by 2'. Even half of this would be very easy to see. In short, we should be able to line up the sun in even just reasonable conditions to well within a mile (1' or so). The sun can be very sharp in a scope behind a filter, even when it is very fuzzy or not even discernible without these aids. The hobby of geocaching has been popular for many years now. In its simplest form, you hide a small container with a logbook in it, then post the GPS coordinates of the cache where interested parties can see them. They then go and find it using their handheld GPSs along with whatever hints or riddles you provide, sign their name in the logbook, put the cache back where they found it, and then post that they have found it. There are many nuances and variations to the process; it is a much more dynamic and engaging activity than that simple description might imply. It turns out that the world headquarters for this activity (www.geocaching.com) is just a couple miles from Starpath HQ. Their office overlooks Lake Union in the Fremont area of Seattle. This is a successful business; there are over 6 million geocachers worldwide, many of whom pay $30/yr for special access and features online, and many must want their excellent $10 app to facilitate the searching and recording. There are numerous other apps from other companies to facilitate the sport. There are more than 2 million registered caches worldwide to be found and logged. The reason the business is so successful is the participants get their money's worth and more. Even those who just do it for a while and quit, do not mind the fees. They have had fun and they learned something. Most members are devoted to the hobby and get much enjoyment from it. For many it is a key part of their social life. It is also a fine example of American entrepreneurship in that the company was started from scratch by a couple young friends with an idea, along with the skill and determination to organize, promote, and manage the operation so it could achieve the outstanding success it has. Now with such good resources, they have topnotch software and services and they have established a set of rules that can preserve their image of the process in light of many challenges. In the Age of GPS, this seems a natural pastime. You cannot do it without learning how to optimize your GPS work. We often get to remind even seasoned navigators about the conversions shown in Tables 1 and 2. You won't get far in caching without knowing that 0.001' of Latitude is about 6 ft, and likewise that this is not true for Lon––that is, assuming you do not have an app that does all the computations for you, which is bound to hamper the will to learn the basics. Furthermore, a commonly reported GPS uncertainty is 5 m (16.4 ft), which also teaches us something: the uncertainty is not necessarily the error. More often than not, you can home in on a target well within the reported uncertainty. GPS positions will scatter about the indicated position with some standard deviation. A good way to study this is just park your GPS linked to an echart tracking program and let it sit overnight. You will get something like what is shown in Fig. 1. Modern handheld units include an option to average the position, even reporting back to you when they have a good fix. It typically takes just a few minutes. Then do the exercise at home with the GPS facing a window with limited view of the sky. The pattern will be different, and larger, and take longer to home in. The significance of that observation is when you are outside you may still have part of the sky blocked off. Just standing next to a big tree could matter, or in a valley, or boaters in a deep fjord. There are a lot of satellites and the units are better and better every year, but this is still something to have in mind at all times. Fig. 1. 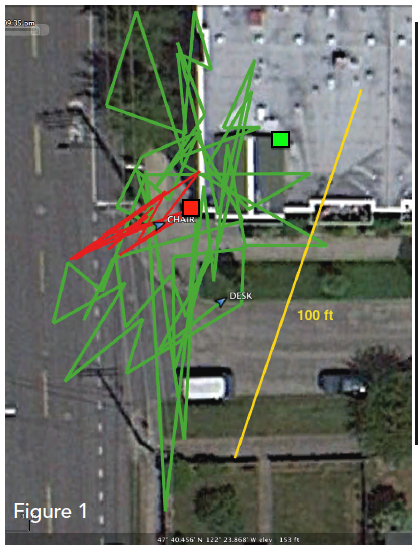 Two 30-minute GPS tracks from stationary receivers. The red track is taken with good reception (Fig. 2) with the GPS located where word “Chair” is shown. The green track taken from a desk inside the building (about 30 ft NE of the word “Chair” viewing satellites through large windows. The yellow line is 100 ft long. In both cases the true positions did not coincide with the centroids of the track patterns. These patterns change with time as available satellites and the angles to them change with time. The arrowheads indicate the COG (of the random motions) at the time the tracks were interrupted. Another example is shown at the end of this article. Figure 2. GPS status information for the tracks in Fig. 1. Top is the status at the end of the good reception (red track) run; bottom is the start of the poor reception run (green track). This display is from the XGPS150 BlueTooth GPS, which pairs with iOS, Android, PC, or Mac devices. The status information was read in an iPhone app; the tracks were accumulated in OpenCPN for the Mac, and then exported as gpx files and displayed in Google Earth. In some circumstances, however, the center of the distribution is not the true location, althrough the true position is usually within range of the displayed accuracy if it is stable long enough. I will come back to such nuances of precise navigation with consumer-grade GPS units in a later article. When tracking down caches you also very quickly learn the limitations of the compass apps in mobile devices. These are still very sensitive to horizontal alignment as there are fixed coils in them that measure the strength of the magnetic field components, and this field is not parallel to the surface because of the dip angle. But with practice we can learn how to use them. 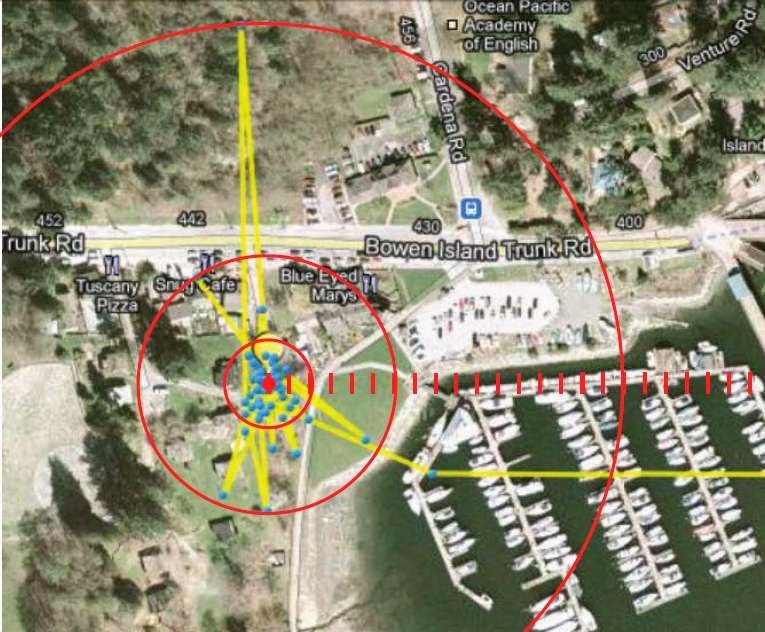 Most mobile-device compasses have self-correcting procedures to adjust for local disturbances, but this does not address the alignment issue. True versus magnetic is not an issue, because they are sitting right next to a GPS. They know where they are so they can compute the magnetic variation very accurately. They all use a program called geomag, which you can download and put into your own computer if you like, which is a nice back-up if you get stuck with old charts at high latitudes (www.ngdc.noaa.gov/geomag). From what I have learned of geocaching, it seems to me this is an ideal way to practice marine piloting. First to fine-tune the use of GPS, which might include learning more about what satellites you are using, and when to expect better fixes when the present ones are not so good (66-ft uncertainty vs 16-ft, for example). Are you next to a bluff in your boat, or between skyscrapers downtown? It will show the value of having a display of the satellites in view and how to interpret it (figure 2), and how to anticipate when this will change. If you are in a real bind, ie traversing a narrow fjord with just a sliver of sky, there are handy free apps that predict satellite passes for your location, with the altitude and bearing of each as they pass. These apps are also useful for predicting the next Metop-A pass for satellite wind data. 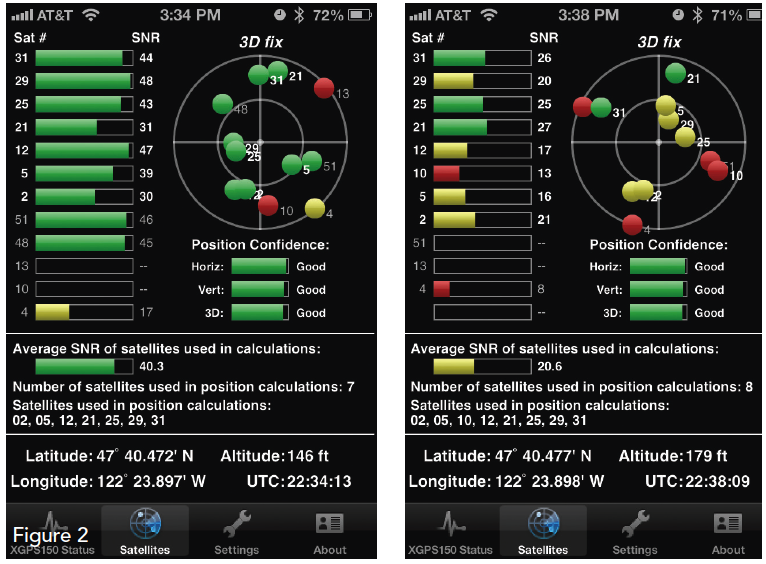 Check your AppStore for a slick free one called Satellite Tracker by MacCon. The main geocaching goal for mariners, however, would be to go on and practice the more sophisticated piloting skills we teach in the classroom. These days, it is only the conscientious navigator––we would say prudent––that takes the time to learn the old methods of navigation, so they are not dependent on the GPS, but there is plenty of evidence that this is worthwhile. Howto Use Plastic Sextants––With Applications to Metal Sextants andA Review of Sextant Piloting. Your accurate position is determined by the two horizontal angles A-B and B-C between three objects (A, B, and C) on the near horizon. These two angles are essentially the differences in the bearings to the objects, but the sextant angles will be far more accurate than bearing differences. Once you have these measurements, you need a large-scale chart that shows the three objects on it, and then there are several ways to solve for your position. The simplest is to use a three-arm protractor, which is designed to solve this problem. Inexpensive plastic ones are available. Set the two angles on the protractor and move it around the chart until the three index lines cross your three targets, and you are located at the hub of the arms. Alternatively, you can draw the two adjacent angles emanating from a single point on a piece of clear plastic (overhead projector sheets, if you remember such things). Then slide that plastic around on the chart until the three lines defining the two angles each cross one of your targets. The Plastic Sextants book also describes plotting procedures that can be used without the need for three-arm protractors or transparencies, which can enhance the accuracy. Another advanced skill of marine navigation that you can practice on land is depth-contour navigation. In the fog with no GPS, you sail on a steady heading and record the depth at several log readings. Then on your chart highlight a few of the depth contours in your approximate region. Then plot a line on a piece of transparency and using the same distance scale as your chart, mark off the logged runs between measured contour depths, corrected for tide and draft. Then slide that sheet over the chart keeping the line oriented in the heading you were sailing until you find the place where you cross the contours at the right rate. In many cases you can get by with a roller plotter and dividers, without the transparency. If the bottom is not flat, nor water too deep, this will often locate your position. To practice on land you can use elevation contours, replacing the depth sounder with a good digital barometer. You do need an actual barometer, however, because GPS elevations reported are not accurate enough for this. Some GPS units and some smart phones have barometers in them, which should do the job. You must always normalize the pressure reading at some known elevation to account for the atmospheric pressure. Both of these exercises can be practiced online, without getting up from the desk! Google Earth shows both precise locations as well as digital elevations (but no contours). You can also drop a pin at locations of interest so they will show up when you print the screen to make your chart. For the depth-contour exercises, it is best to use the USGS National Topo Viewer (viewer.nationalmap.gov/viewer), again zooming in on what you need and plotting out a chart. Check out all the tools options for measuring distances, spot elevations, and so on. It will help ID the contours and distances between them. Google Maps has a terrain view that shows some contours, but nowhere near as good as the USGS Viewer. When you are standing at the cache, the angle between this one (#1) and the next one to the south (#2) will be 30º 36.0’, and the angle between that #2 and the next one to the south (#3) will be 24º 18.0’. Use the base of the objects for the target. Where is the cache? (2) Now with same targets, use 1 to 2 = 22º 16.8’ and 2 to 3 = 24º 24.0’. Now where are you? (3) Finally, use 1 to 2 = 21º 47.4’ and 2 to 3 = 25º 41.4’. Again where are you? In these last two examples you are finding locations that are less than 10 ft apart, and these angles viewed through a sextant are huge differences. A handheld GPS would rarely be able to pin point a location to this precision. (1) Here is an example of depth-contour navigation. You are walking (sailing) somewhere in Central Park in NYC, and you measure the following elevation (depth) records on heading 298T on a leg that is 0.436 nmi long. Where are you located when your barometer (depth sounder) reads 88 ft? As with marine navigation, step one is identify the contours. You know the answer is just downhill of 90 ft and you were at 90 ft for a distance of 248 ft. Find where there is 0.267 nmi between 80-ft contours on heading 298, or use other patterns. To work this online, it is important to use the nationalmap viewer referenced above. It has many layers that let you measure specific elevations and the distance between them. There is a bit of a learning curve on their site, but well worth the effort. Or just find any detailed view of the contours and print them out and work it by hand. If you do soundings exercise like this just once, you will forever be a better navigator. You may not have call for depth sounder navigation very often, but when you do need it can save the day and you will be prepared. Click here for the answers to the above exercises. Below is another example of a GPS running overnight with positions stored. In this case the positions were from a Yellow Brick tracking GPS and the results were posted online automatically. The unit was left on by mistake on a hotel room deck in Snug Harbor, BC at the center of the distribution. A topic has come up in our weather course that deserves extra information having to do with oscillating wind shifts. We will address this issue more specifically shortly, but for now we need to show a couple pictures and give some references. It is a safe assumption to expect the wind to shift when a large cumulus cloud goes by, especially with relatively low base. We do not mean squalls. We have much written in our weather book and radar book on winds near actual squalls, before and after downburst. The point we make now is this wind behavior on a smaller scale can also be seen under fair weather cumulus. It is especially important for sailors when there is a symmetric pattern of the clouds passing over, or a sequence of them in a line... and especially important in a yacht race, in the ocean or on a large inland lake. A general rule easy to remember is the wind will shift when one of these clouds goes by. Predicting the shift is more involved, but a related pretty good rule is if the cloud is not raining, it is pulling the wind into it. That is, biasing the ambient flow toward the cloud. But the final surface wind is a vector combination of cloud wind and ambient wind, and thus the comlication. For now let us just give a couple references, and we will add more discussion and more references as soon as possible. See Chapter 8, Winds near Clouds, in High Performance Sailing by Frank Bethwaite. Below is a picture from that book. Another good reference is from a similar book by C.A. Marchaj, called Sailing Theory and Practice and a couple sample images from Part IV, Wind and Water, section (3) Local Wind. These are not books one might have turned to for weather tactics, as they are mostly concerned with yacht design, but they are both excellent texts on many aspects of sailing, and since the authors are engineers as well as sailors, they use real numbers, which are often missing in sailing books. Again, I will return to this topic as time and student interest requires. But the above pictures are the hints, and then just imagine a row of these clouds going by that you have the option to choose a route though. Somewhere in our notes we have such a picture made and we will look for it. I have seen such patterns in the ocean and it was quite remarkable how predictable the shifts were in direct correlation to what we could see over head.